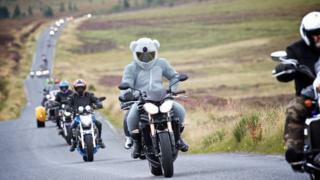 Thunder in the Glens, Europe's largest gathering of Harley-Davidson bike enthusiasts, has begun in the Cairngorms. The event, which is centred on Aviemore, is taking place until Monday. About 2,200 Harley-Davidson owners have registered for the 21st Thunder in the Glens and a further 600 could register over the next few days. Thousands of people interested in seeing the rally are also expected to head for Aviemore. Police Scotland said some of the busiest roads were expected to be the A95 around Grantown on Spey, A939 near Lochindorb, B9007 around Duthil and A938 at Dulnain Bridge. A ride-out, a mass road trip by motorcyclists, is due to happen between midday and 13:00 on Saturday. This will involve the A95 Aviemore to Grantown on Spey road passing the Granish junction at the northern end of Aviemore.